Fort Fanning was built in November 1838 during the Second Seminole War and was first called “Palmetto”. Later it was renamed in honor of Colonel Alexander Campbell Wilder Fanning, who had served under General Andrew Jackson in the First Seminole War. Its purpose was to protect the highly strategic and heavily utilized crossing of the Suwannee River. 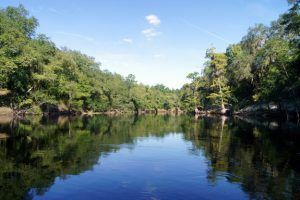 It also served as a base of operations for U.S. and Florida Militia troops that tried to suppress the activities of small bands of Creek and Seminole warriors that operated from the vast swamps of the lower Suwannee River. Raids and battles were a constant part of life in the region for both whites and Indians during the years 1836-1842. The fort was garrisoned for nearly five years, during which time, 31 soldiers lost their lives, all but three of them from sickness. The post was abandoned in February 1843 and because it was made of wood and situated in a warm humid climate, it soon deteriorated. 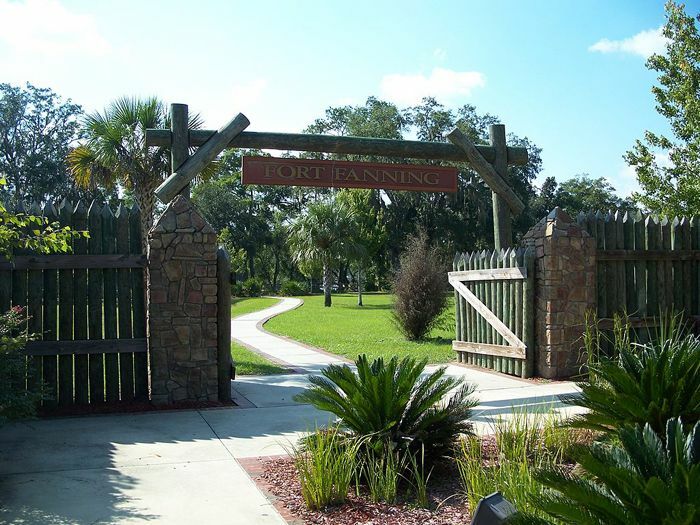 The site of Fort Fanning is preserved today at the Fort Fanning Historic Park in Fanning Springs, Florida. The city-owned facility is located at the original fort site and features the reconstructed gates and a section of stockade wall. Paved walking paths leading through the site and a series of beautiful overlooks that provide great views of the Suwannee River. It is located at 9930 Kentucky Avenue in Fanning Springs, Florida. Just across U.S. Highway 19 is Fanning Springs State Park, home to natural spring that feeds the famed river.